I am attempting to install a program for a class using WINE, but during installation the installer detects that it is running in an environment other than Windows 7/8/10, and refuses to install. How can I make the installer think it is running in Windows? The operating system is not adequate for running VitalSource Bookshelf. Fortunately, I don't need to use it right away, but I do need to get it to work somehow. What can I do to determine the reason the installer is rejecting WINE, and if possible, how can I fix it? As you said, Win 7/8/8.1/10. In Wine configuration, start via Configure Wine, you can select 95/98/ME/2000/XP and so on and Windows 8, too. All right? You will need to use wine1.7 to be able to configure the Windows version to a newer release than XP, I think. 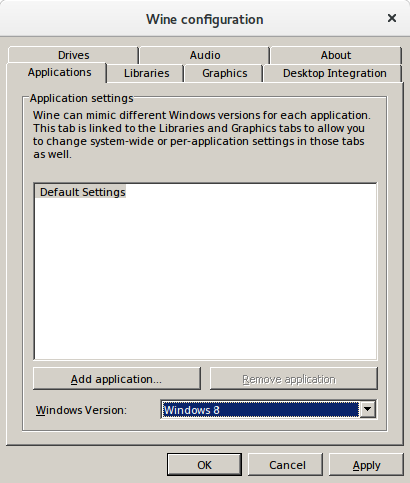 Once installed, you will need to run winecfg and select Windows 7 or one of the other newer versions that is required, and you should be able to install your application. However, you may still encounter other issues with it, and may need to actually run it on Windows, either directly on hardware, or in a VM. How to make WINE be quiet about MSVCR errors? Installing Oracle Service Cloud (Legacy Name: RightNow CRM)?